A tale of two Goudas. Yes, this is not the way Charles Dickens started. Here we compare two Gouda cheeses, not two cities. We’ll compare this cheese and the more mature (aged) Gouda cheese here. But first, this is a nice mild soft cheese. It’s good by itself. I’ve also tried it melted with cheddar cheese in a grilled cheese sandwich and melted on onion soup. Both worked well. But if you’re looking for a stronger more mature cheese taste, this is not what you’ll want. This cheese is soft, has little or no rind, is very mild in taste, has no crystals, is aged around 6 months, and has a red wax covering which helps tell its age. 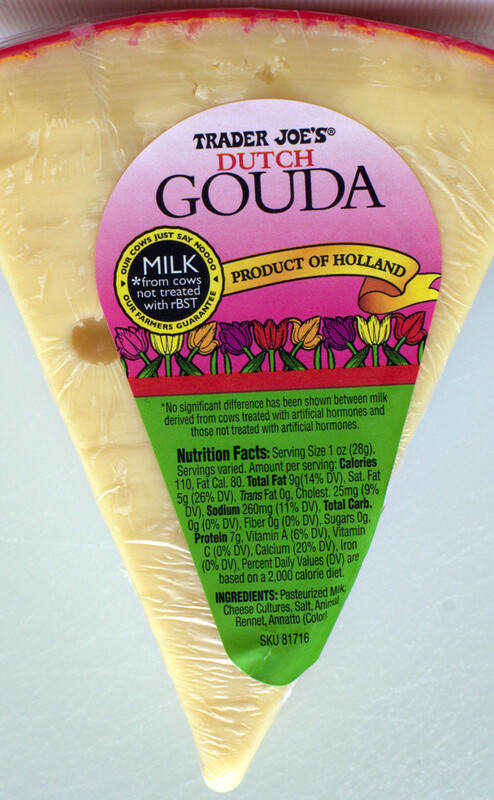 Our older Gouda has much more flavor, is semi-hard, has a noticeable rind, contains calcium lactate crystals, is aged probably twice or thrice as long, and has a black wax covering indicating a more aged cheese. In a nutshell, the difference between the two is the taste and texture which changes the same cheese over months of controlled aging from a soft mild cheese (this cheese) to a harder tastier cheese (here). Oh, and, the older cheese is twice the price. That’s the story of a tale of two Goudas. This entry was posted on 11/08/2016 at 18:51 and is filed under Recipes, food, cooking and related items, Trader Joe's. You can follow any responses to this entry through the RSS 2.0 feed. You can leave a response, or trackback from your own site.